Each year, for The Catfish's birthday bash – an occasion that typically involves a multi-venue poker crawl and much fun – Cavalier Brewing has created a new beer. This year was no different, with the Fitzroy venue's third birthday being the debut for the Double Life IIPA. It's a beer with roots in the first birthday too, although those roots remain shrouded in mystery: something to do with a very long night and the bar's house catfish, Muddy Waters, revealing a hitherto unknown dark side. Whatever lies at the heart of the mystery, the unofficial challenge set down by the Catfish crew for its annual collaboration was that Cavalier should try to create an 8 percent ABV beer that drinks like one far smaller. 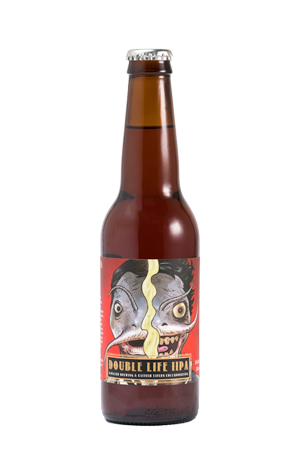 With Double Life, this means a double IPA loaded up with Amarillo, Mosaic, Chinook and Ella – a combination that delivers more on the dank, earthy, piney front aroma wise then sneaks in some orange citrus flavours too. We say "sneaks in" as balancing all those hops is a pretty solid wall of caramel malts that play as much of a role in Double Life's character as Muddy Waters' late night Mr Hyde side apparently does to his.